I originally clicked open this book in NetGalley because of the question inherent in the title—If You Could Be Mine… what? Why can’t she? And when I read the description my next question was, well could she? And that hope prompted me to read and review this title. The book takes place in Iran, a country that I, admittedly, don’t have much direct knowledge about. Although the Iranian culture plays a large role throughout the story, there is nothing so stark that I was distracted from the story of two teenagers in love. Love stories often transcend barriers, whether they be cultural, generational, or familial. Learning about the Iranian culture turned out to be one of the most intriguing parts of this book. The story takes place in present-day Iran, a country where homosexuals are imprisoned, tortured, and in some cases put to death for this “sin”. Despite the harsh treatment of homosexuals, the culture does offer an alternative for people who feel they are living in the wrong body—transexuality is fully legal and supported. It is viewed as a “sickness” to be remedied rather than a sin. It is in this culture that Sahar and Nasrin struggle to hide their love. And when Nasrin’s marriage is arranged, Sahar is willing to do whatever it takes to keep her. As a reader, I found all of the characters to be wholly believable—none of them is perfect and all of them struggle. Fear, selfishness, self-loathing, loyalty and love are the emotions that are threaded through the narrative and Sahar is a wonderfully sympathetic character to root for. 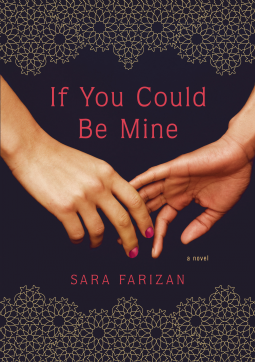 In If You Could Be Mine, Farizan gives voice to a people that must remain under the radar, or risk death. She sheds light on what it’s like to be a teenager, to be gay, to be fearful, and to be in love. Although the story takes place in Iran, one can easily see how these feelings span cultures—there are small-minded people and small-minded communities all over the world, even close to home. This book will be well-loved by fans of The Miseducation of Cameron Post and The Difference Between You and Me. I requested If You Could Be Mine from the NetGalley catalog and read it using the Kindle app on my iPhone.